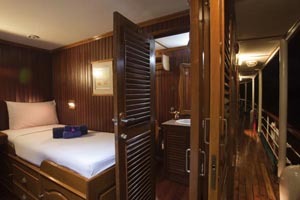 The RV River Kwai, the first inland cruise ship in Thailand, is a newly built colonial style river cruiser based on designs used by the original Irrawaddy Flotilla which was founded in Burma in 1865 and by the 1920s was the largest privately owned fleet of ships in the world. The RV River Kwai carries a maximum of 20 passengers in 10 teakwood cabins (single deck) and operates on a 4 days/3 nights year round program every Monday-Thursday and Thursday-Sunday on both Upstream and Downstream programs alternately. 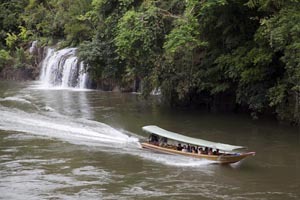 The RV River Kwai opens up an entirely new area for river tourism in Kanchanaburi province west of Bangkok. Every morning and afternoon land excursions are offered to visit attractions along the river including temples, historic sites, Khmer ruins, waterfalls, war cemeteries, hot springs, the bridge on the River Kwai, and local attractions, etc. 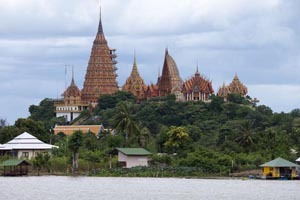 Asian Trails Thailand offers special tours for Kanchanaburi and excellent rates for the 4 Days RV River Kwai Cruise (Downstream - Every Thursday) starting from 2012-05-01 to 2013-10-31 including all taxes and service charges. 07:00 - Depart from Bangkok by van/coach to Kanchanaburi via Nakorn Pathom. 09:00 - Short stop to visit the highest Chedi in Thailand called "Phra Pathom Chedi" which is the largest pagoda in Southeast Asia. 10:30 - Visit to Khao Noi Cave Temple (Wat Tham Khao Noi) located on the west bank of the river. The monastery was constructed on a hill, decorated in the form of Chinese architecture and cultural art. From the top of the monastery observe the beautiful scenery of Kanchanaburi and its mountainous horizon. 11:30 - Continue to Kanchanaburi. 12:30 - Lunch at Sommai Restaurant. 13:30 - Proceed to Hell Fire Pass, a part of the Death Railway cut through the stone mountain. Trails lead to Hin Tok Bridge and Konyu Cutting where a plaque commemorates the ordeal of Australian and British POW's who undertook the hazardous work in precarious conditions at the aptly named pass. The memorial complex (Hin Lek Fai) is intended to honor the Allied Prisoners of War and conscripted people from India, Burma, Malaysia and other countries who died during construction of the railway, as well as all who suffered as a consequence of the hardships. 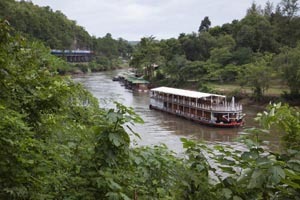 16:00 - Embark RV River Kwai at Daowadung Bridge and cruise downstream on Kwai Noi River. 19:30 - Dinner and overnight on board at Sai Yok Yai Waterfalls. 08:30 - Visit a boarding school nearby the bank of Kwai Noi River built under the patronage of H.R.H. Crown Princess Sirindhorn for refugee children. 09:45 - Continue by coach to visit Hin Dad Hot Spring, formerly called Kui Mang. It was accidentally discovered by Japanese soldiers who were supervising the construction of the Death Railway. The natural hot spring features two large pools and private baths. The mineral in the spring is believed to cure many diseases, e.g. beriberi (lack of vitamin B), arthritis, etc. 10:30 - Visit to Pha Tad Waterfall located in the western zone of Si Nakharin Dam National Park. It originates from a small stream called Huai Kui Mang. Pha Tad is one of the most beautiful waterfalls in Kanchanaburi Province and flows into the Kwai Noi River. 11:30 - Board RV River Kwai at Kaeng Pa Lorm. 13:30 - Lunch on board while cruising downriver to the Floatel Jungle Raft. 15:00 - River rafting or canoeing downstream on Kwai Noi River. If time allows, visit nearby Mon Village. 19:30 - Dinner and overnight on board near the Resotel. 11:45 - Lunch on board while cruising downriver to Wang Pho Bridge. 13:00 - Board the coach to visit the Krasae Cave situated on the bank of the Kwai Noi River, an excellent view point. The cavern houses a Buddha image. 13:36 - Take a 3rd class train to Tha Kilen Train Station passing over the long wooden viaduct. 13:51 - Arrive Tha Kilen and continue by coach to "Prasat Muang Singh", historical park with Khmer architecture from the late Lopburi period, some 700-800 years ago. The extensive ruins of the temple beside the River Kwai Noi are a potent reminder of the vast expanse of the Khmer empire. The ancient border town of Muang Singh, "City of the Lions", was probably established as a trading post. 15:00 - Return to the RV River Kwai at Prasat Muang Singh and cruise downstream. Afternoon at leisure on the boat. 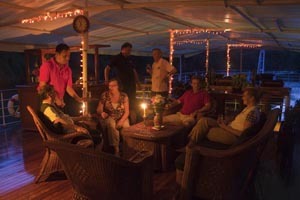 19:00 - "Farewell Dinner" and overnight on board, near Ban Kao. 08:00 - Breakfast on board while cruising downstream to Wat Tham Khaopoon. 09:00 - Visit to Wat Tham Khaopoon, a Buddhist temple which served as a big camp of World War II. There is a middle cave containing stalactites and stalagmites and many remarkable Buddha images. Behind the temple enjoy a marvelous view down the valley of the Kwai Noi River. 09:30 - Continue by coach to Kanchanaburi to visit the world-famous bridge over the River Kwai. 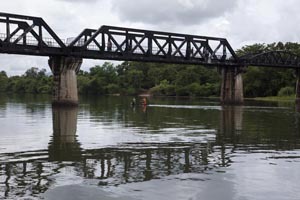 The sturdy Iron Bridge spanning the River Kwai Yai, which was a crucial part of the Death Railway, was built in some 16 months by Allied prisoners of war and Asian conscripts. The bridge was destroyed in Allied bombing raids towards the end of World War II and was later rebuilt by the Japanese as war reparations. Continue to the Thailand-Burma Railway Center Museum, an interactive museum which provides a remarkable research and information centre dedicated to presenting the story of the Thailand-Burma Railway. Finally, visit to the Donrak War Cemetery which contains the remains of 6,982 Allied prisoners of war who perished during the construction of the "Death Railway". 12:30 - Rejoin RV River Kwai at Saphan Mai and lunch on board while cruising towards Nong Ya dock. 15:00 - Disembark RV River Kwai at Nong Ya dock and return to Bangkok. 18:00 - Arrive Bangkok and transfer to your hotel or to Bangkok Airport. Children of 4 years and older must solely occupy a berth and pay the full rate (same as adults). Infants below the age of 4 years may sleep in their parent's cabin without extra charge but parents are to provide own baby food. NO triple rooms or extra beds are available. Accommodation on RV River Kwai, meals as mentioned above, coffee, tea & drinking water. Transfers and sightseeing tours with English, French or German speaking local guide (together with other cruise members). Expenditures of a personal nature for bar and laundry. 20% deposit is required upon confirmation of any bookings, refundable up to 61 days before departure and non refundable for charters. The ship's purser and captain are jointly responsible for passengers' comfort and safety. Passengers must accept their decisions and instructions. Whilst our crew do everything in their power to facilitate landings, access to the ship at certain river stations can be difficult, with steep and sometimes slippery riverbanks. Elderly clients should consult their doctor to ensure that they are fit for travel. Wheel chairs are not allowed. In the case of water levels being too high or low or defects to the vessel beyond the control of the shipping line an alternative itinerary will be offered to passengers after consultation between the ship's captain and Cruise Asia Ltd. management, subject to accommodation and meals being maintained on board the vessel unless by prior agreement with the Charterer. Should it prove difficult to embark or disembark passengers at the scheduled points Cruise Asia Ltd. is not liable to bear any extra cost of transporting passengers to and from the revised point of embarkation or disembarkation unless passengers or their agents have purchased a complete package tour which includes land services from us. Any reason for changing the points of embarkation or disembarkation can not count as a reason for cancelling this contract. Clients should seek advice from their doctor regarding relevant inoculations and prophylactics for travel in Thailand. Clients must be fully insured to cover any risk of medical repatriation and the Cruise Asia Ltd. is in no way responsible for such liabilities. The company accepts no liability or responsibility for loss or damage to passenger's property whilst on board a company vessel. During the river stops on the company provide an escorted service but not always a licensed guide service. If passengers wish to bring their own state-licensed guide then guide accommodation in the crew quarters may be offered subject to availability at a special rate. The company reserve the right to refuse to allow anyone on board if a ticket cannot be produced and the company can not guarantee the exact allocation of cabins and deck location which may in the event of extenuating circumstances differ from the cabin number indicated on the ticket. Within the ticket price fuel costs have been calculated on average prices as of the publication of this document. Should fuel prices rise by more than 10% Cruise Asia Ltd. will be entitled to impose a fuel supplement equivalent to the amount by which the fuel price exceeds the price allowed for in the contract. Infants below the age of 4 years may sleep in their parent's cabin without extra charge but the Cruise Asia Ltd. cannot guarantee the availability of a cot. Children of 4 years and + must solely occupy a berth and pay full rat. In the event that one passenger enters into a commercial or other form of relationship or arrangement with another passenger the company is no way liable for the obligations of one passenger to another passenger or any claim arising thereof. If as a result of any such relationship or arrangement entered into without the involvement of the company by prior agreement then the company is in no way liable for any claims from either party of any nature whatsoever.